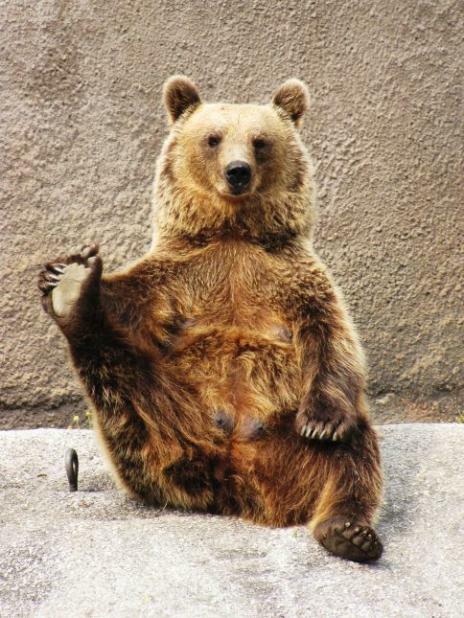 The exercise craze has been building and building but who would have thought we would see a bear doing yoga! But then Mimmi, who was born in the Ahtari Zoo in Western Finland, does have three 2-year-old cubs – maybe she is trying to keep in shape so she has enough energy to chase after them. Even though it was a blistering hot day in July 2010 when these photos were taken, and all the other zoo animals were drowsy and quiet, Mimmi kept to her routine of morning stretches. She held each position for two minutes then moved on to the next. Photographer Meta says, "She did three different poses. First one leg up and she held it with her hand (or front paw? ), then the other leg and the other hand, then both legs up and holding them with hands and again and again. She did two or three rounds while I was there." These stretches lasted at least 15 minutes. Mimmi was never taught to do this by the zoo keepers, but she may have learned from her mom who saw handlers being amused when she tried different movements. Neither were actually “trained”, just the occasional treat from keepers. Mimmi is teaching her own two-year-olds to do yoga as well!Though they don't have her perfect balance yet, it must be adorable to see them trying.